Even an adventure story can be a quiet tale. 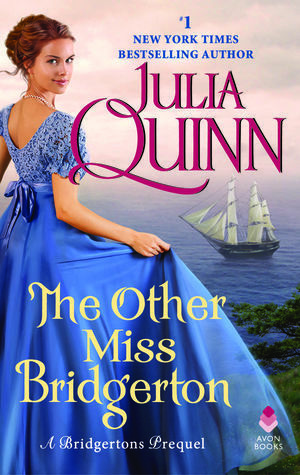 The Other Miss Bridgerton is part of the Rokesby series by Julia Quinn. This series is connected to the Bridgerton series, but it is about the generation before the characters we all know and love. A prequel. The Other Miss Bridgerton was a delightful holiday treat, but it could be read any time of the year. Our heroine is Poppy Bridgerton and she is a mighty curious person. Our hero is Andrew Rokesby, aka Captain Andrew James, and he is on the receiving end of Poppy’s curiosity. I loved Poppy. As I said before, she is a curious person. Some people might classify that as nosy but there isn’t anything negative about her snooping. She’s just a unique person who doesn’t quite fit in. She has an inquiring mind, she’s open to adventure, and she isn’t always careful as to where that adventurous spirit might lead her. For instance, her curiosity might get her transported to a pirate ship. You see, one day Poppy wanders into a cave which turns out to be where some privateers have hidden their loot. Unfortunately for her, two of the privateers – Laurel and Hardy – discover her, bundle her up in burlap, and take her aboard their ship with a rag stuffed in her mouth. The rag is there because she just keeps talking, talking, and talking. They take the rag out of her mouth once she’s on board, however, and she won’t shut up – so, they put it back in her mouth. Then they leave her and try to decide who is going to tell the captain. By the way, they aren’t really named Laurel and Hardy. It just seems as if they are. The ship sets sail and by the time the captain is reluctantly told about their captive guest, it’s too late to return her. Captain James is not a happy camper. He is on a secret mission, he has a deadline, and much to his chagrin he discovers he has a Bridgerton on board. Even more upsetting to him is that his older brother is married to a Bridgerton. He has a big problem. Not only does he have a mission to complete, he has an innocent woman to get back on shore without anyone finding out. He tries to keep his distance, but it isn’t long before Poppy wiggles under his skin. The romance slowly builds in this story. A lot of the scenes in the book are more sensual then sexual and it’s a slow burn until their relationship finally explodes. There isn’t a ton of token whankee-roo scenes – which is nice for a change. We have two likeable characters who have a tender relationship which slowly blossoms before our eyes. I enjoyed this story quite a lot. While it didn’t contain some of the bells and whistles of some of my favorite Julia Quinn stories, it was a very charming story, filled with humor, banter, and lovely dialogue. The characters worked together, the romance slowly bloomed from friendship to lovers to a couple who respected each other and one we have no doubt will last a long, long time. A gentle story, which I recommend.